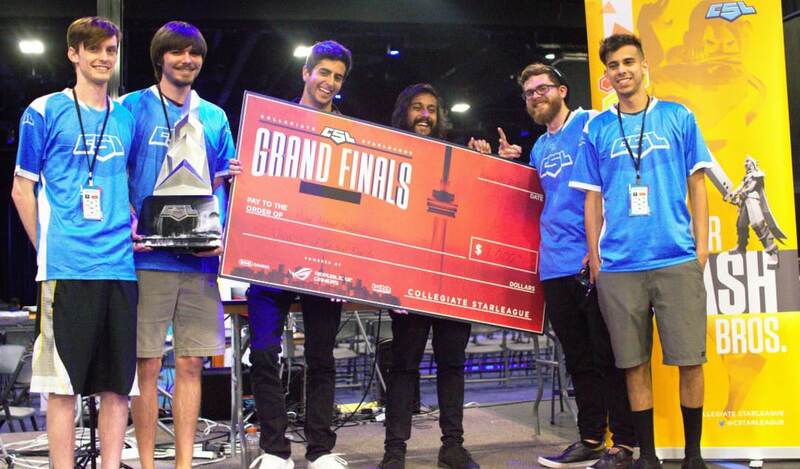 In the year that passed since last Shine and the unveiling of the CSL Smash circuit, 183 teams have celebrated victories and defeats on the grueling path to national finals. The prize pool of $15,000 per game loomed overhead, ready for a worthy college to seize it. In Super Smash Bros. Melee, none other than reigning champions University of Central Florida answered the call last Friday night. Rocking their utterly stacked roster of power ranked and top 100 players, the teams in their way were unable to keep up–but their road to first place was by no means free. UCF’s first set was against University of Illinois Urbana-Champaign, who they took on last year in the grand finals of The Melee Games 2016-17 season. Both teams’ rosters have changed in some capacity since then–Lad and Thailer, the last players on screen for each team before UCF closed it out, have both graduated. UCF had six stocks remaining when they won in 2017, but UIUC closed the gap a bit by wearing them down to five this time. Regardless, the improvement wasn’t significant enough to convert into a win. Drunksloth went on a 7 stock rampage to eliminate Deegs and Blendtec, as well as weaken shabo, allowing Panda to come in and close out the set. UCF and UCSD met in winners finals. Panda opened strongly for UCF, taking out Destroyah and a stock from Mixx. Drunksloth came in next, only losing one stock in the time it took him to eliminate Mixx, then taking all four of MoJoe’s stocks and being knocked out by their captain EastCoastJeff. After having their lead minimized by Jeff’s Fox, Quixotic came in and decimated Envy, leaving only the captain and strongest player on the team, Gahtzu (ranked #44 worldwide), remaining for UCF. Gahtzu toppled Quixotic immediately, booking their trip to grand finals against Virginia Tech, who made their way up from the lower bracket. In the ultimate showdown, UCF expected to face their greatest threat yet–but instead, after Father and Envy fell to VT’s Nox and Rok, Panda came in and ripped through their roster. Panda took out Puddle and Edric convincingly, and still managed to take a stock from Zain on Final Destination before drunksloth came in to seal the deal. It was official–UCF had repeated history and won their second consecutive national collegiate Melee championship, as well as $9,000! On the Smash 4 side of things, Stony Brook University delivered on their expected first place finish. 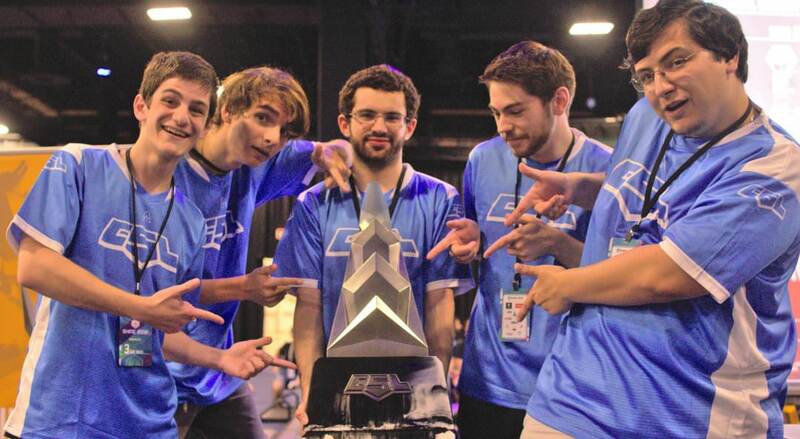 With the #3 player in the world Dabuz at their disposal, this team made a dominant run to nationals. Their first set was against UC Irvine from the western division, forecasted to be the second strongest team, with a well-balanced lineup of skilled regional players and top tier characters, plus a few surprises. The set opened up in true Smash 4 fashion with a Bayonetta ditto between SBU’s Vino and UCI’s Bran. UCI took the first match by one stock, prompting SBU’s captain Aceto to step up to the plate with his Meta Knight. As the best player on the team after Dabuz, Aceto lived up to his reputation by taking Bran’s last stock, all three of T3Dome’s (with the help of self destructs), and two from Jingen. Up 9 stocks to 7, SBU was in a good place–they sent in Grash to replace Aceto, meeting Jingen in the Captain Falcon ditto. This pick set them back quite a bit, as Jingen almost made a miraculous 3-to-1 comeback to eliminate Grash and take the lead back. When he failed to close it out, UCI put in Uyi, who took out Grash and made SBU bust out the big guns. 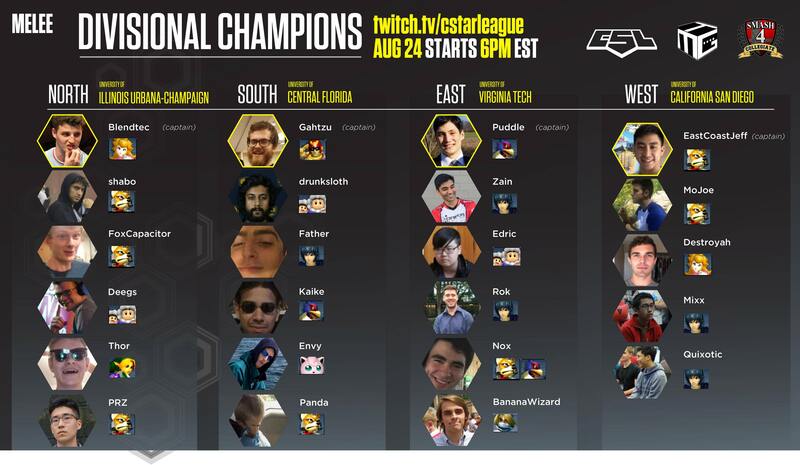 Dabuz melted away Uyi and Jovanni after him, and then they were in winners finals. University of South Carolina were next up, starting with their captain Fluzi’s Wario. SBU’s Eclipse led off with Cloud, diverting from his typical pick of Sheik. Fluzi won with one stock remaining, and Dabuz came out early. His first match was a huge statement, taking Fluzi’s last stock without even being hit a single time. After that, he went on to annihilate Thundersz’s Fox and El Chapo’s Mewtwo without dying once. 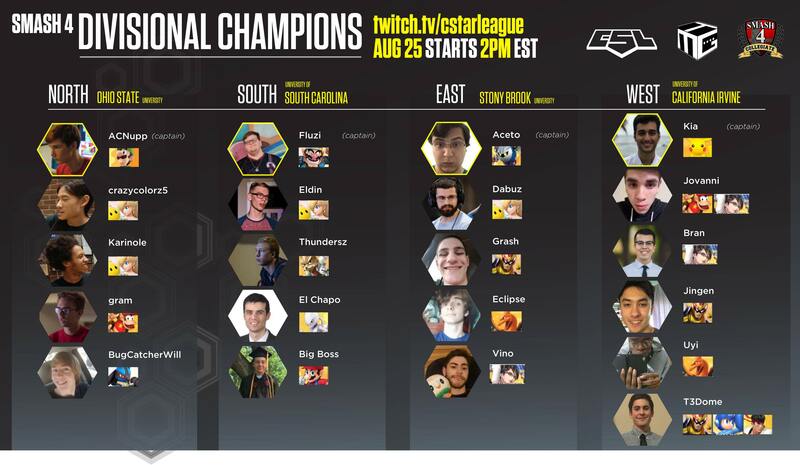 USC had finally decided enough was enough, sending in their best player Eldin, who uses Rosalina & Luma like Dabuz. Eldin’s performance was remarkable, keeping pace with Dabuz and taking two stocks, nearly a third. Big Boss’s Mario came in to take Dabuz out at long last, but lost two more stocks for USC in the process. Grash came in to secure SBU a spot in the winners side of grand finals, but gave them a scare in the process as he lost two stocks before closing the door on Big Boss and USC. After the lower bracket concluded, UCI was the last team remaining, earning themselves a shot at redemption for the national championship. They changed their strategy up, this time starting with Uyi’s Charizard, as SBU stuck with Vino. UCI once again came out on top of the first game, with Uyi even going on to take two more stocks from Grash on SBU’s counterpick. Bran came in next to make an incredible run through Grash, Eclipse, and two of Aceto’s stocks for a total of six. The massive lead generated by Uyi and Bran’s performances put UCI in a fantastic position, with only one of Aceto’s stocks and Dabuz remaining. T3Dome got his chance in the spotlight after a clumsy performance in the winners bracket set, claiming Aceto’s final stock and one from Dabuz. With two players still available for UCI, the lead was insurmountable even for the third best player in the world–Jovanni came in to reset the bracket, landing Stony Brook in the losers bracket for the first time since October 2017. Going into the second set, UCI stayed with Uyi as their starter based on his previous opening. SBU, on the other hand, made an insanely bold play–to field Dabuz first. This pick could have played out in one of two ways. Either Stony Brook would be off to a massive lead to start, or his effectiveness would be minimized by a series of strong UCI players chipping away at him. Things already looked rough for the defending champs when Uyi took one of Dabuz’s stocks in the first game, perhaps signifying that SBU’s master plan was a bust. Next was Jingen, who took another stock–and Jovanni after him, doing exactly the same. With the score at 7 to 12 and Dabuz gone, UCI could still see a shot at victory. Regardless, the rest of SBU’s team held it together just long enough for Grash, the last man standing, to defeat T3Dome in the last game of the season with two stocks remaining. Stony Brook has earned their first CSL Smash national championship title, and $9,000 for their crew! Congratulations to all teams that participated, and we hope to see you next year!